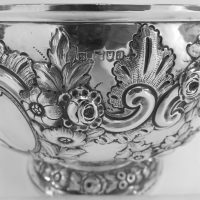 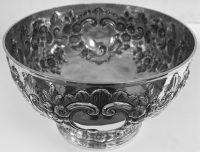 Victorian, sterling silver, round, hand chased, footed bowl. Made By William Gibson & John Langman of The Goldsmiths & Silversmiths Co. 112 Regent Street London. 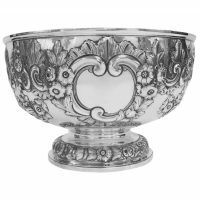 The bowl beautifully hand chased on body and pedestal foot with floral decoration. 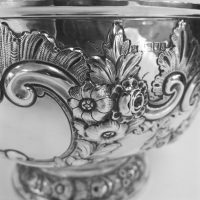 The body with two blank cartouches Measures: 11.5" diameter x 7.25" high Hallmarked, London, 1896.